As millions of students are beginning their first year of college this fall, they have countless new experiences. New school, new friends, new living situations, new freedoms. While all this occurs, personal finances are sure to be the last thing on an eighteen year old's mind. Unless a student majors in finance or accounting, they do not get much exposure to the intricacies of personal finance. It is important for college students to be familiar with financial literacy and know the impact that present choices can have in the long run. Here we'll look at a few ways to cultivate financial literacy and avoid common money mistakes made by college freshmen. Most expenses of high school students are covered by their parents, so it can be a shock to a college freshmen when they are faced with the task of managing their own money. Students should create an initial budget before school starts. They will know estimated costs - tuition, room and board, food - but will have a much better idea of how much they are spending after being in school for a few weeks. A more realistic budget can be made about a month into the semester, after true costs are reevaluated. If students find they are spending too much, they will have to learn how to be more frugal with their spending and evaluate this every month to stay on track. At this point, not everything is learned in a classroom! Mint is a great website and app to work on budgeting skills and track expenses - and it's free. It is ideal for students since their budgets can be accessed on a computer or from their phone, and it will send notifications if you get close to or go over a monthly budget. This way students should always have an idea of where they stand with their monthly budgets. During the first few months of college, there are many opportunities to sign up for credit cards. However, the interest rates are much higher for students since they are new to credit. 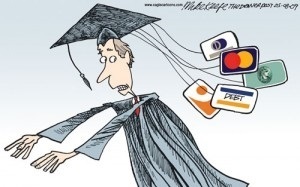 Most students will already have considerable debt from student loans, and credit card debt is not something you want to add to the mix. Getting a credit card is a great idea when it is used responsibly, and not used as "free money". When used responsibly, it can be used for students to build credit. Examples of responsible use would be paying the card off every month, on time and in full. Keeping balances at about 10% or less than your credit card limit is ideal and important so credit card debt does not build up. Mint also has credit score reporting, so students can access their budgets and check their credit score all in one place. When students get to college, they often forget that scholarships are still up for grabs. While most scholarship applications are only open to high school seniors, there are many geared towards current college students as well. It is important that college freshmen are in touch with their financial aid officers and ask questions about what options are available. Financial aid offices will let students know what type of scholarships are out there and how they can apply. Of course, an online search can help with the pursuit of financial aid and scholarships. Even the smallest scholarships can make a difference in the grand scheme of college finances, and it is important to know what what options are available. Scholarships.com may be a great place to start a search. Peer pressure can be hard to rise above in college, especially if your friends are constantly going out to eat or have a big spring break trip planned. While this is all a part of the great college experience, it is important to know that money for these fun plans has to come from somewhere (and that most parents aren't willing to fund a wild spring break in Cabo). Students should learn to prioritize which things they really want to spend money on, and if those plans are over budget, look for lower-cost activities or a part time job. There are many on-campus jobs and work-study programs available, often with hours that work with students' current schedules so they never have to miss class. Students can work on setting goals of what they really want to do throughout the year, and set aside money monthly to work up to those goals. For example, one could set aside a ski trip fund for winter break and build up some savings little by little if they have extra funds each month. Attending classes can fall under the peer pressure category as well, and everyone knows that 8 am classes are not the most exciting way to start the day. While most students ditch a class here and there and end up being fine (they say C's get degrees), it is important to keep in mind the financial impact a failed class can make. If one fails a class, they will have to retake it. Some classes are only offered in spring or fall and are often prerequisites, so if a student has to wait a whole semester to retake a class this can extend an undergraduate career and end up being very expensive. While the social aspects of college are a part of the whole experience, it is important to understand the price and value of a college education. As mentioned before, it's a great option for students to take part time jobs in college, but that doesn't mean you have to make minimum wage. There are a few ways to make more money per hour in jobs like tutoring or leveraging a hobby. Parents will often pay $15-$30 per hour for college students to tutor their children. Sites like Etsy make it easy for students to leverage their interests like art and make a profit on their projects. Using these types of websites often keep expenses low while allowing students to enjoy work and do so in their own spare time. Blogging, photography and graphic design work can fall into this camp as well since it can be paid hourly, or by project. Students don't have to settle and have the opportunity to pursue their entreprenurial spirit while in school. While there certainly is a learning curve for students beginning college, planning, prioritizing and being creative can help them in the long run. I was never a finance major, but working in the industry now has opened my eyes to the importance of knowing where you stand with your money, no matter how old you are. Being financially aware and literate can benefit students by helping them avoid debt and learn the value of money. Not having a lot of money is definitely a theme of the college experience, but a little planning can go a long way and set students up for success in their personal financial matters. The opinions voiced in this material are for general information only and are not intended to provide specific advice or recommendations for any individual. 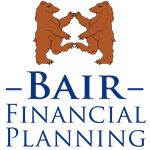 WCG Wealth Advisors, Bair Financial Planning, The Wealth Consulting Group and LPL Financial are not affiliated with Mint. Reaume, Amanda. “Money Mistakes of College Freshmen | Money.” Time, Time, 5 Sept. 2015, time.com/money/4023116/money-mistakes-college-freshmen/.